From Ascoli Piceno to Urbino it is a short two-hour drive, offering beautiful views of the Adriatic coastline. Enroute we made a brief stop at the city of Loreto, home of the house (originally in Nazareth) where the Virgin Mary lived and raised Jesus. According to tradition, the house was moved here by angels, more likely by crusaders. 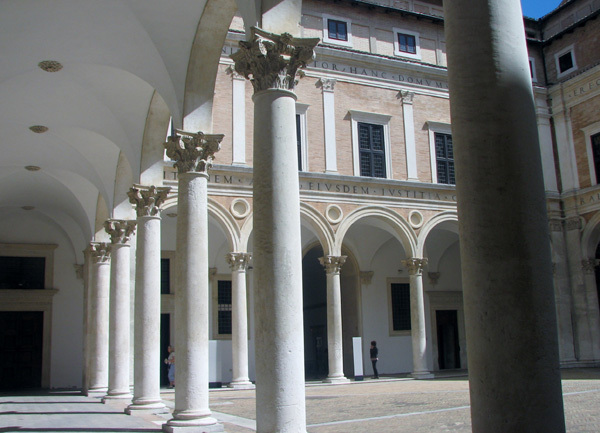 The "Holy House" is surrounded by the enormous Basilica della Santa Casa with its incredible collection of art. 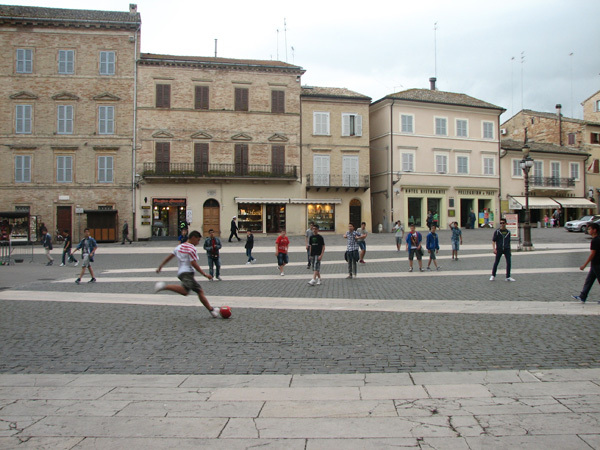 Before entering we crossed the Piazza della Madonna amid the inevitable soccer game. After lingering over frescos and Mary's primitive stone house, whose exterior walls were surrounded by marble sculpture, we headed back to the car. A sudden downpour forced us to take refuge at Tacabanda Ristorante, where we lunched on pizza with tomatoes, mushrooms and arugula over cheese, accompanied by the house red. Delizioso! The rest of our drive was sunny and pleasant. 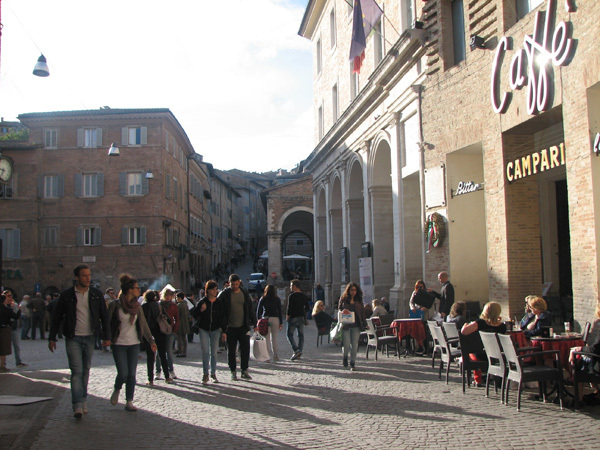 Urbino, a beautiful hill town, traces its roots back through medieval times to the early days of the Roman Empire. After settling in our hotel room, we rested until passeggiata time . This highlight of the day brings family and friends to the Piazza della Repubblica , where they catch up on the latest news. Today it was crammed with university students toting backpacks, laptops and cell phones, eager to mix work with pleasure outside or in one of the many caffe's. We located a table with a good view of the piazza, ordered drinks and contentedly began the process of selecting a place for dinner. A commotion distracted us in the form of a lady speaking loudly as if protesting something. Accompanied by her dog, she worked her way through the piazza shouting passionately about her cause, whatever it was. After a relaxing interlude, we continued our evening walk, pausing at San Francesco to enjoy the last part of choir practice. Heavenly! Then we were off again to Via Raffaello and the Antica Osteria dalla Stella for dinner, only to learn that they were fully booked. After making reservations for the following evening, we began a new search. On a side street and a bit off the beaten path we came upon La Taverna Degli Artisti. From the happy sounds emerging from within we sensed an opportunity to absorb local culture and taste some home-style cooking. 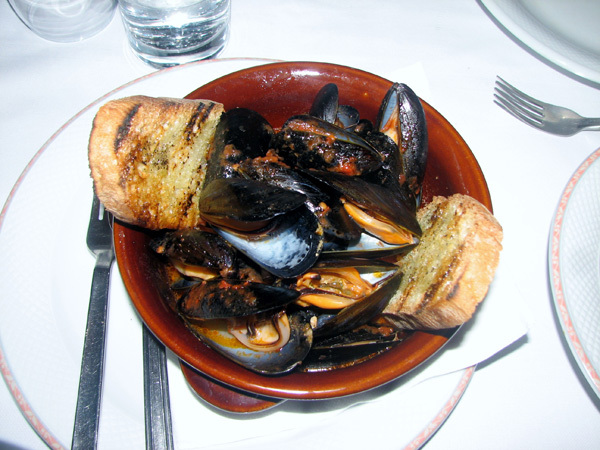 served in a light garlic, wine and tomato broth. Next we moved on to "strangozzi con salmone, asparagi, funghi" (thick spaghetti-like pasta, salmon, asparagus and mushrooms) served in a smoked cheese and cream sauce. We concluded our meal with an "insalata verde" (mixed greens) as we finished our wine. Taverna Degli Artisti was busy but not hurried. Its clientele represented a unique cross-section of diners. There were high school kids celebrating a birthday, ladies enjoying each other's company, men eating pasta and drinking Italian beer, while sharing their adventures along with a hardy laugh or two. All this made for a delightful evening. The next morning we headed to Duke Federico da Montlefeltro's Palazzo Ducale, a majestic example of renaissance architecture. Harmoniously built, it offers its visitors an impressive arcaded courtyard with Corinthian columns. The duke and duchess each had a suite of rooms housing magnificent collections of art. 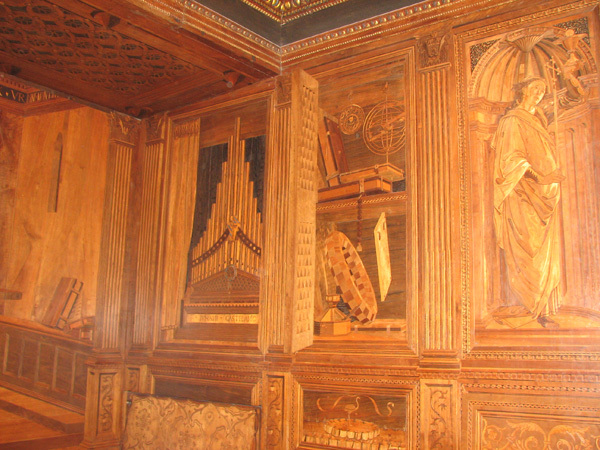 Quite unusual was the duke's private study featuring intarsia everywhere on doors and cabinetry. These intricate pictures, created of inlaid wood and designed by Bramante, Botticelli and Francesco di Giorgio Martini, were breathtaking. Our exploration of Urbino continued as we strolled the stone-paved streets, while admiring the architecture and beautiful flowers. We came upon La Balestra Antica with an courtyard for dining. This was an inviting location overlooking a huge,150 year-old plane tree in a park across the narrow street. Our lunch included olive ascolane, verdura fritta (deep fried vegetables) and an insalata with pears and fossa (local cheese) along with a glass of verdicchio. We had been looking forward to visiting the house of Raffaello. Both artist and architect, he was born in Urbino. His home included two living areas joined together by a courtyard with a bridge over the courtyard connecting the second floors. The rooms contained some of his artwork and we were most impressed by a fresco of madonna and child, which he painted when he was a boy. 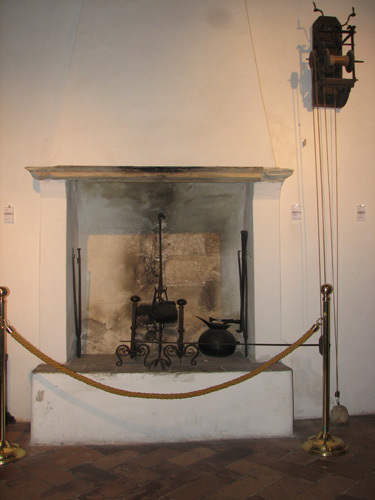 Also interesting was his invention, a rotisserie powered by pulleys and weights. And now for our greatly anticipated dinner at the Antica Osteria dalla Stella... We began with a small bowl of pea soup, dressed with "olio d' oliva". It's marvelous flavor was just perfect for stimulating our appetites. Believing that dinner without a fine wine would be unthinkable, we ordered a bottle of Lacrima di Morro d' Alba, 2011, an unusual red with hints of apples, pears and quite possibly rose petals. Our antipasto was duck breast served with prunes and candied lemon, dressed with a flavorful sauce of peppers and diced vegetables. This was followed by "mezzaluna al cacao", (half-moon shaped pasta flavored with cocoa), stuffed with ricotta and Parmigiano cheese, topped with black truffles. We also ordered pumpkin risotto with goat cheese and almonds. Our taste buds danced with joy! Lastly we shared a "crostina cioccolata ", a small, warm chocolate cake with melted chocolate inside, served with a cherry gelato. This evening was a culinary delight and a perfect ending to our stay in Urbino.